Steve Jobs, Apple CEO comes back from medical leave with a bang to release sequel of Apple's sensation IPAD. He officially released Ipad 2 which is thinner, lighter and faster than its predecessor. Meanwhile, Steve Jobs gets a standing ovation when he appeared on the product release conference. Apple has officially launched its 2nd generation iPad. Apple CEO Steve Jobs made it official in iPad 2 launch event at the Yerba Buena Center for Arts, San Francisco on wednesday. 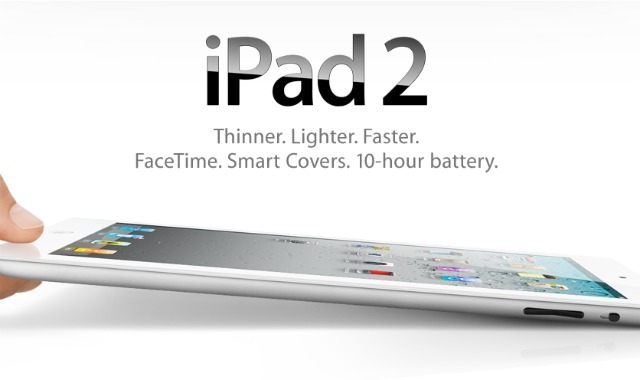 According to Jobs, iPad 2 will be a lot thinner, lighter and much faster then its predecessor. Check out iPad 2′s detailed features below. It is about 33% thinner or 8.8mm in width. (The original iPad was about 13.4mm wide). It will be running iOS 4.3, which will be available for download on March 11th for iPhone, iPod Touch and iPad. The battery time is same as its predecessor, which is expected to be 10 hours. The only thing that remains the same is the 9.7-inch 1024 x 768-pixel IPS display. Price of iPad 2 starts at $499 for a 16GB WiFi-only which goes up to $829 for a 64GB + WiFi + 3G SKU. It will be available on AT&T and Verizon networks in both Black & White colours . Check out more official snapshots of Ipad 2 here.